Following your bliss is something I'm very familiar with. I've made it a personal goal to stay in tune with what I'm passionate about and what brings me joy. Sometimes you have to take risks to find your bliss, sometimes bliss finds you when you don't even know what you're looking for. For me personally, starting my business has been my bliss. Though things aren't always a piece of cake- remembering why I started & what makes me insanely happy, always brings me back down to ground when things get tough. 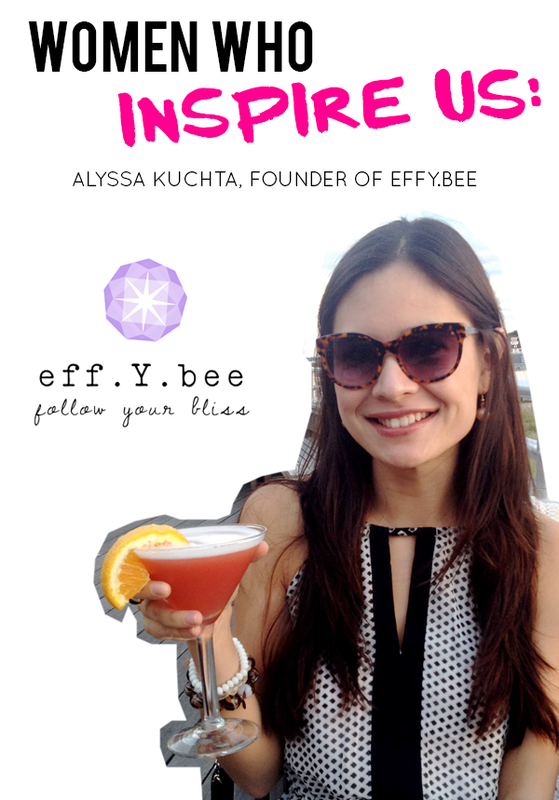 Founder Alyssa, Kuchta of eff.Y.bee Jewelry (that's follow your bliss)! can relate. 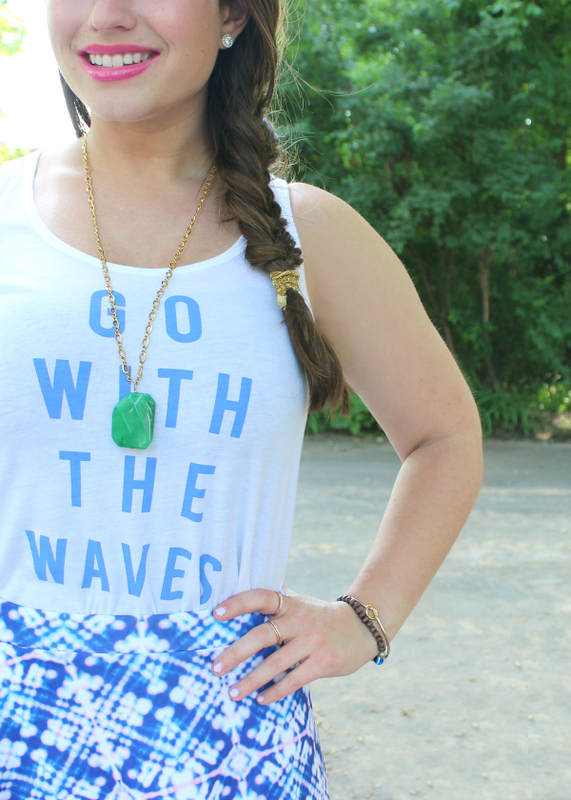 She's sharing her story of launching her jewelry line while still in college (a girl after my own heart), advice for fellow women entrepreneurs, and why she doesn't worry about competition. As she mentions, finding your bliss is about more than dreaming- it's about doing. How fitting is our latest wallpaper/printable freebie?! 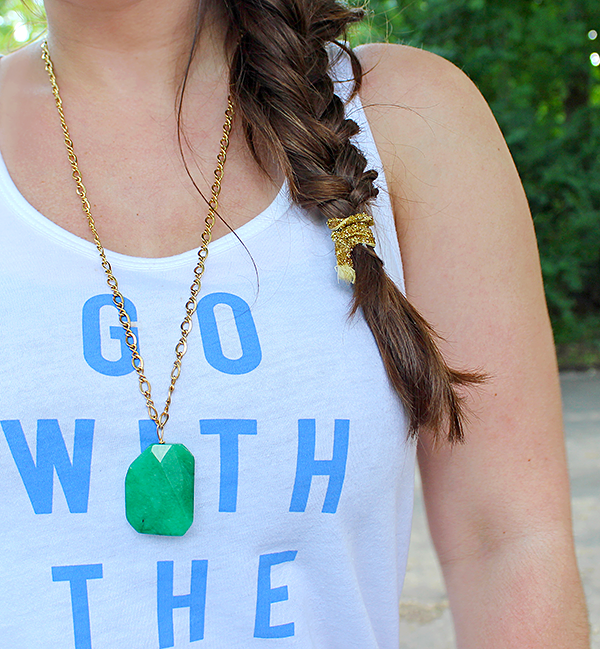 Harper necklace, a great way to add a fun pop of color to any outfit. 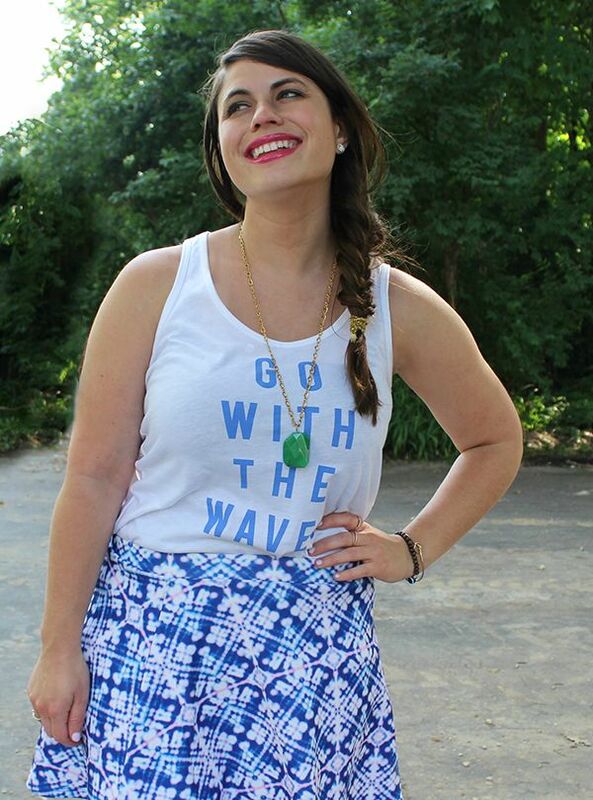 I just picked up a ton of surfer girl style graphic tanks from Old Navy last weekend and I've been wearing them nonstop. Be sure to check out the LPF Instagram later tonight- I'll be teaming up with eff.Y.bee to give away one of their Harper necklaces like the one I'm wearing! P.S. 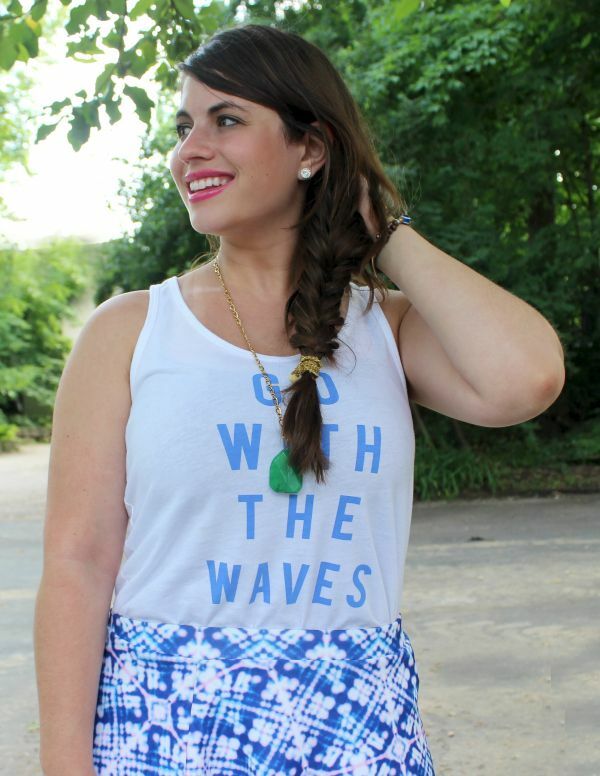 FINALLY am starting to get the hang of the fishtail braid - this tutorial majorly helped! Alyssa was also sweet enough to take the time to answer a few questions about the journey of starting her own business and advice for anyone wanting to do the same! LPF: What's the story behind starting eff.Y.bee? Alyssa: I experienced a "mid-college crisis" during my junior year at the University of Delaware, realizing I hadn't figured out what I was passionate for and I had no idea what I wanted to do after college (I was majoring in Psychology and Chinese at the time). I was working at a local boutique and began volunteering for an organization on campus called Students for Haiti. It was within these two experiences that the inspiration for wanting to start my own line came about- learning the ins and outs of running a small business, being exposed to many jewelry lines, and also finding passion in giving back. It was a way to combine two things that I found excitement in and creative fulfillment. My friend Nelly helped me come up with the name "eff.Y.bee" which stands for follow your bliss. It's always been our go-to advice to each other and the name has a deeper meaning which I hope to inspire in our customers - that anything is possible when you follow your passions! The summer going into my senior year, I started making pieces (without any real knowledge of what I was doing) and launched a website. In the Fall I began selling on campus through trunk shows partnered with Sororities and the Campus Fashion Magazine, UDRESS. Starting a business while a student was the best decision I could've made, there are so many free sources on campus, professors who are willing to help, and of course I'm so thankful for all of my friends and Sorority sisters who were my first customers and continue to support eff.Y.bee today! LPF: What's been the biggest "win" for eff.Y.bee so far? Alyssa: The biggest "win" to me is our amazing Brand Ambassador team. We're currently on 21 college campuses with a team of 34 incredible young women who are extremely passionate about our brand and go above and beyond to contribute and help us grow. It always excites me to see a new applicant in our inbox, there is no greater feeling than seeing someone who loves eff.Y.bee as much as I do. Having our own shop at Bryant Park's holiday market two years in a row was also the most incredible experience. Being able to create an environment that embodied the brand, meet new customers face to face, and have a physical location for people to visit with a direct few of the Empire State Building was so much fun and definitely a pinch me moment! LPF: How would you describe the eff.Y.bee girl & her style/passions? Alyssa: The eff.Y.bee girl is passionate, optimistic, and daring. She's on a mission to live each day striving to follow her bliss whether that's finding the beauty in the little things or working towards her life goals. She is a dreamer but a doer, she is sweet and wholesome, and believes in who she is and who she is going to become. Her style is effortless but always put together - a touch bohemian and a touch classic. She loves wearing a bold colorful stack of a bracelets and a simple pendant necklace, paired with a dress or a pair of boyfriend jeans, a white button down, and a fun pair of flats! LPF : Read any great business/self-help books lately that you'd recommend? Alyssa: Start with Why by Simon Sinek, Never Eat Alone by Keith Ferrazi, Rich Dad Poor Dad by Robert Kiyosaki, The 4-Hour Work Week by Timothy Ferris, The Secret by Rhonda Byrne, Ask and It is Given by Esther and Jerry Hicks, and Marie Forleo's B-School program was completely life changing for me. All are must-reads!!! LPF: What advice do you have for other young women entrepreneurs? Alyssa: Infuse your individuality, your story, and your personality into everything you do and you'll realize there is always room for more and there is no competition (whether your launching a brand, a blog, or applying for a position) because no one will ever be exactly YOU or do things with your exact style. Stay reminded of why you started for when things get tough- create a vision board with your goals that you can look at daily and stir that excitement back! Stop comparing yourself to others and focus on yourself, you don't know their journey. Confidence is everything, don't forget it! Have mentors and advisors to help guide you and surround yourself with the people and things you love, cut the rest! What will you do to find your bliss?